I hope everyone had a restful Winter break! I know that my holiday was just the fuel I needed to kick start me into the second half of the school year! I live in Central Illinois and we have SNOW in the winter. I am jealous of anyone who can walk out the door in January and not have to worry about scraping ice off your car windows! (Smile) But the fun thing about the winter is all the activities that you can do with things snow related. I love the cute faces of snowmen and the lacy look of snowflakes! Also, my birthday is January 1 (Yep, I was a New Year's baby! 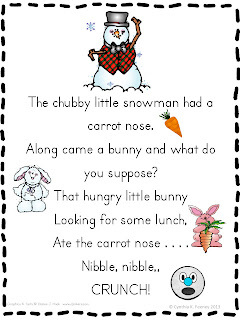 ), so in celebration of Winter AND my birthday, I created an activity for one of my favorite Winter poems - "The Chubby Little Snowman." Click on the image of the poem to grab a copy over at my blog!